Mapping is displayed as text above the letter. User can drag any letter, not just the currently selected one. Drag occurs anywhere in the letter’s area, not just on the stitches. 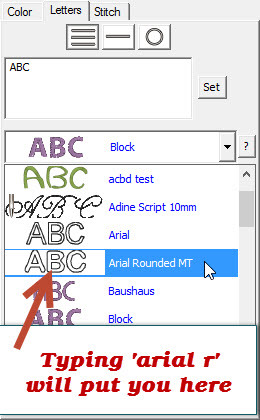 Imported fonts now have an attribute “Hidden” which means it will not be displayed in the font selection pop-up in the Letter properties pages. The top, center and bottom measurement of the selected letter is now shown in the importer. When a user is dragging, they can hold the Ctrl key to move at 1/10th the rate for more precise alignments. The reason for these is to accomplish more precision with letter overshoot – above/below the baselines – and to allow that overshoot to be made similar on multiple letters by matching the values as needed. When a Lettering design is selected, there is now an added ‘Stitch’ property for imported fonts. This is analogous to the ‘Stitch’ page for built-in font Lettering. It contains some simply density and compensation control. Also imported fonts can now remove overlaps intra-design similar to the built-in fonts (even appliques). This is NOT the same as Enthusiast or DRK adjustments; it is only available on mapped fonts, making them similar to built-in fonts. Some of you have a zillion mapped fonts. Great! But you have the long list to scroll through. We were able to give you a little help. Click the arrow to pop-up the list of fonts. Now, type the first few letters of what you’re looking for. On Mac you get to type just a few letters because that’s how Apple does it, and they don’t let us change it. On Windows we have overridden it to work as follows: You can type and even backspace. We know some of you want rather more extensive user interface for this, but for now there just isn’t anything practical. We’ll figure it out eventually. We note that neither Apple nor Microsoft have fathomed anything better yet, so it may take some time. There is an updated 3D rendering system. This is visible in the main view as you zoom in, and also in the Save Image Utility from Enthusiast: Designs are now rendered at 600 DPI which gives the ability to zoom in and have a clear image. Designs with selected objects are now shadow-highlighted in the tree. Satin columns with low density generate better (stay within the outline) even on narrow, tightly turning shapes. Automatic column splitting has been improved. Fills have been sped back up. Overwriting StitchArtist working (.BE) files has occurred when a user opens the stitch file, then does a plain ‘Save’ or ‘Save Working File’ and then says ‘its Okay to Replace my file’ (which saves over the working file that wasn’t open). It sounds innocent – you made changes – but wiping out the objects is not fun. Now we have a mechanism to protect you from accidentally doing this. When saving a working file ‘over’ another (replacing) the program checks the current one on disk and compares the two. If the one being saved was not ‘Opened’ as the one on disk, it will be given a version number (ex:(2) in its name). This version system will save someone out there a lot of work! But please quit replacing your files in the first place — add your own version number – its good practice, and lets you try variations out to see what you like best. Auto-Satin objects in StitchArtist were never really intended to be ‘auto-digitizing’. However, yes we see that a lot of people just want it to be auto-digitized TrueType. So we’re moving in that direction by creating branched objects. When you make an auto-satin (no incline lines) object, and it has to split the shape up, it will now walk all the underlays first, then do the top-stitch, and honor the entry/exit. While not a true auto-digitizing feature, this will help significantly. Some of the StitchArtist folks have asked for a ‘Reset’ button because they have messed about with the properties and don’t know what they’ve done. All the properties are explained in the manual and videos. However, since we have a QuickStyle system in there anyway, we’re opening it up for Level 1 and 2 users to do the ‘reset’ by clicking on the QuickStyle button in the object properties. There you will see typically a ‘Normal’ style that exists for you. This is the default as if you’ve just opened the program. 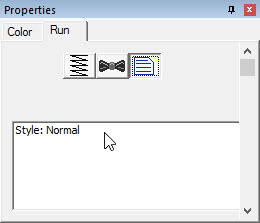 Click on this and your object properties will revert to their factory settings. Be careful if you’ve already set your run style to double etc., as that will get reset too! User-defined QuickStyles are scheduled to be released with Level 3. Some letters had minor jumps not visible in home machines but were affecting commercial machines. These now have internal stitching adjusted to cut the number of apparent trims. If the hoop is not touched, it won’t change the hoop on the page. This was an annoyance. Field size now shown in mm and approx inches. 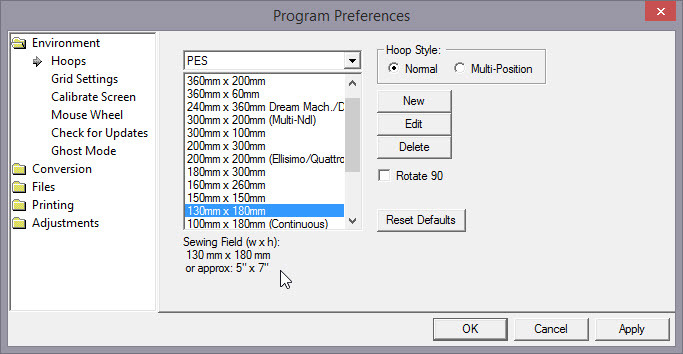 When selecting a hoop, it is now also shown in approximate inches. Since the beginning, the Platform has combined identical-and-sequential colors in the Property page. This is for the sanity of the user – things like lettering may have any number of objects to create the letter, and you don’t want to have to color all those individually. Also, when saving, identical-and-sequential colors get combined. So this has always been natural. However, life is getting more complex with projects that are now possible with appliques, etc. So we have decided that only for stitch files, we will show all the colors for the purpose of colorization, regardless of object selection. This lets you adjust it easier (you don’t have to select the object to color it). Many users simply haven’t discovered the Object Tree or have decided that checking their work is too much effort. As you know, we try to remove all effort, mental or physical, from the embroidery process. Note that this does NOT mean that objects of same-color won’t be combined when saving. If you want the machine to stop, give it a reason. We’ll see about some method for refined-control over this in the future. Were some bugs fixed? Sure. Everything we have actually open for a consumer is working, per our usual. Got a bug, feature request or a question? We don’t know about it unless you ask. Please make use of our state-of-the-art support ticket system by clicking the ‘Contact Us’ link at the top of the website. It’s free, easy, has no Growth Hormones and is completely Organic! Posted 3 years, 11 months ago at 4:07 pm. "Thank you so much for creating software for MAC users! I"m new to embroidery and am loving it. I"ve got all your software including the Fonts collection #1."